Despite being a condenced version of the original novel, Vagabond still packs a solid punch. Shinmen Takezo and his friend, Hon'iden Matahachi, simply wanted to gain honor and glory. As young men, they decided the best way to do so would be to take sides when Tokugawa Ieyasu attempted to overthrow the rule established by Oda Nobunaga and his followers. Unfortunately for Matahachi and Takezo, they chose the wrong side. When they returned to consciousness following the bloody battle of Sekigahara, they awoke wanted men. 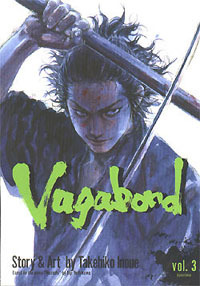 The previous two volumes of Vagabond explain how Takezo and Matahachi escaped the patrols of the newly established Tokugawa Shogunate in a desperate attempt to return to their home village of Miyamoto. However, while hiding at the estate of a middle-aged widow, Matahachi realizes he doesn't want to return home, so Takezo ventures on alone. Trying to get home as fast as possible, Takezo kills a number of men patrolling the borders between towns, and things become more complex. Eventually, Takezo becomes a fugitive from his own village, and evades capture until Otsu, Matahachi's fiancee, lulls the savage brute back to civilization. Enraged at his actions, the town attempts to kill Takezo by hanging him from a tree for several days. Otsu, pained by the consequences of her actions, helps Takezo escape from his fate. Book three begins with the figurative death of Takezo, and the birth of Musashi. What I find somewhat odd about this adaptation of Yoshikawa's novel is that many key scenes are missing from this part of Musashi's history. In the original work, Takezo is given his new name (Miyamoto Musashi, so he will remember where he came from) and then is imprisoned in small room with only books to keep him company. He is told that the room is only a prison if he makes it a prison, for within the books Musashi can find true freedom. For three years, Musashi studies in his cell, tempering his animalistic nature while he discovers the true Art of War. This pivotal formative experience in the legendary sword-saint's live is inexplicably absent from Inoue's manga. Up until this point, I was supremely satisfied with the retelling of events, but I find this omission rather unsettling. Aside from the complaints about the changes in content, this remains a fantastic work of art. Inoue captures Musashi's fatalistic attitude with supreme skill. Characters remain unique, backgrounds are fully realized and authentic, and there are some color pages thrown in for good measure. This is easily one of the best looking manga I've ever read. Some people were wondering how it compares to Blade of the Immortal, and I'd have to say I prefer this style more. While Blade of the Immortal is beautiful in its own right, it's not drawn with the same precision, and tends to seem less focused. That's not a bad thing for that particular story, but for Musashi, Inoue's talents are easy to appreciate. Another positive trait of this edition is the top-notch production quality. It's a right-left manga, sold at a lower than average price, and there's nary a typographical or grammatical error to be found. Over all, as previous editions in this series (and contrary to what we can usually expect from Viz, which tend to be left-right and more expensive) this is how manga should be sold. The only technical complaint I'd have deals with the long waits between issues of successive volumes, but if the quality of the work is going to be this good consistently, then I don't mind waiting. Overall, this is a great historical manga for those of you who want a break from supernatural, science fiction, or fantasy comics. There are some genuinely funny moments here, but more than anything Musashi is an epic drama that shows what happens when man tries to reach his potential. Changes and omissions notwithstanding, I still look forward to this visual depiction of the life of one of Japan's most beloved and influential historical figures.